When Arjuna won Draupadi at the swaymwara, Duryodhana who had thought that he had killed the Pandavas in the lake palace, came to know that they were alive. He feared that Yudhisthira would come and claim the throne of Hastinapur. 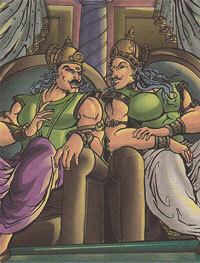 Karna who was the best friend of Duryodhana, told him about a plan to get rid of the Pandavas. The Pandavas were staying in the palace of Drupada, king of fort Panchala, So Karna suggested Duryodhana to take the army of Hastinapur and attack Panchala, and capture the Pandavas. Duryodhana was delighted and went to the elders of Hastinapur to seek their approval. Bhishma, Drona and Vidura condemned the plan and warned Duryodhana against his evil designs. Although Dhritarastra in his heart wanted Duryodhana to be king, he had to go along with the decision.